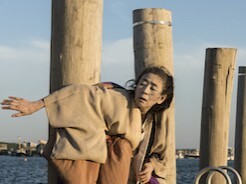 Eiko brought her A Body in Places solo to The Yard this June. 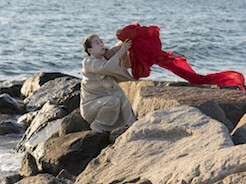 Eiko performed in two distinct locations: A Body in Edgartown at a beautiful home of Sally Cohen and A Body in Meneshma at Menemsha beach and harbor in Chilmark. All performances were admission free. Koma also premiered his new solo, The Ghost Festival at the Yard in the same week. Also read Gwyn McAllister's article in Martha's Vineyard Times.